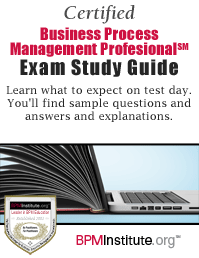 Ready to start preparing for the BPM Certification Exam? BPM Governance and BPM Center of Excellence. This Study Guide in combination with our BPM Skills Self-Assessment are intended to assist you in preparation for the Exam. PLEASE NOTE: Purchasing of the Study Guide should not been seen as a substitute for work experience or formal study in the Business Process Management discipline.